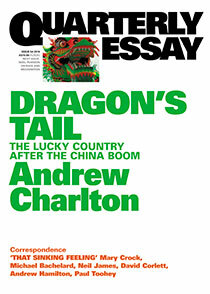 It was lovely weather on the weekend, I could’ve gone out and had fun which I did a little bit, but I was more intrigued to stay in and read by this issue of Quarterly Essay and its main feature article ‘Dragon’s tail: the lucky country after the China boom‘ by Andrew Charlton. I spent my weekend reading his 70 pages long essay because I am not only interested in his view of what has happened to Australia’s economy – (mining boom economy) but I also anxious of what might happen next. Evidently China’s economy is slowing down, quite a lot. How has that affected Australia? What will this mean to a nation as small a population of Shanghai but as rich as a king with all its unearthed treasures? Charlton writes about what has made China achieve its economic development, which was 100 times more quickly and on a scale 1000 times larger than Britain’s industrial Revolution. How this is closely associated with Australia’s economy and its prosperity in last two decades. He looks back to similar booms in Australia’s history, such as the Gold Rush and agriculture development during colonial time when Britain hungered for natural resources, as well as wool and wheat and why the resource based economy crashed in the end. While Charlton warns of the dangers to our mining economy he also provides suggestions or remedies to sustain our vulnerable economy – 1st to increase the flexibility of the economy; 2nd to limit the spending effect; and 3rd to make other non-resources sectors advance such as ‘goods and services, from health and aged care to tourism, education, financial services, household goods and high quality food’ (p63-66). This economy still has close link to Asia but can bring long term prosperity in the future. He notices that ‘ our fate will never be fully in our own hands and we will be perpetually mining our prosperity from a thin seam of the global economy.’(p70) However he thinks that ‘ as a nation we have to be smarter than this. If we are happy to leave our prosperity to luck, we can continue to bob up and down on the tide of global circumstance; but if we want to be a successful country, we need to learn to surf the waves’ (p71). Andrew Charlton was a senior economic adviser to Kevin Rudd’s government from 2008 to 2010. Charlton is also the author of Ozonomics, Fair trade for all (co-authored with Joseph Stiglitz) and Quarterly Essay 44, ‘Man-made world’ which won the 2012 John Button Prize. Charlton has worked at the London School of Economics, the United Nations and Boston Consulting Group and studied at Oxford University as a Rhodes Scholar. The essay is easy to read, even for a non-economist like myself, because Charlton writes with such clarity that you won’t miss his points. This entry was posted in Non Fiction and tagged Adrew Charlton, Author, book review, Dragon's Tail, Parramatta City Library, Writer by admin. Bookmark the permalink.